Inspite of the Hurricane Sandy, Google following the famous saying “ The Show must Go on”, went on with its event, unveiling some of the most important releases- The Nexus 4 smartphone, Nexus 7 and Nexus 10 tablets and the latest Android 4.2 Jelly Bean version. "Today, we’re excited to announce three great new Nexus devices … in small, medium and large," wrote Andy Rubin, Google's senior vice president of mobile and digital content, in the Oct. 29 post. "And they all run Android 4.2, a new flavor of Jelly Bean—which includes the latest version of Google Now and other great new features." The new Nexus 10 tablet built by Samsung proved to be the highest-resolution tablet on the planet with a 10.055-inch display at 2560-by-1600 (300ppi). The Nexus 10 runs on Android 4.2 (Jelly Bean) and is powered by a 1.7GHz A15 dual-core processor bundled up with 2GB RAM. It has a 5 MP Camera on its back and a 1.9 MP Front facing Camera. Google Chrome, Gmail, Google Talk, Google Maps for Android, Google Search, Voice Search, Google Now Google+, Gmail, YouTube, Google Currents, Google Play Store, Google Play Books, Google Play Movies and Google Play Magazines. It is reported that this device aims at giving the users a suitable device for watching movies or reading magazines on its display. Connectivity options include Bluetooth 3.0, Wi-Fi, micro USB, micro HDMI, dual side NFC and GPS+. Weighting 603 grams, the tablet will have a 9000mAh battery onboard that is likely to offer up to 9 hours of video playback and up to 500 hours of standby time. 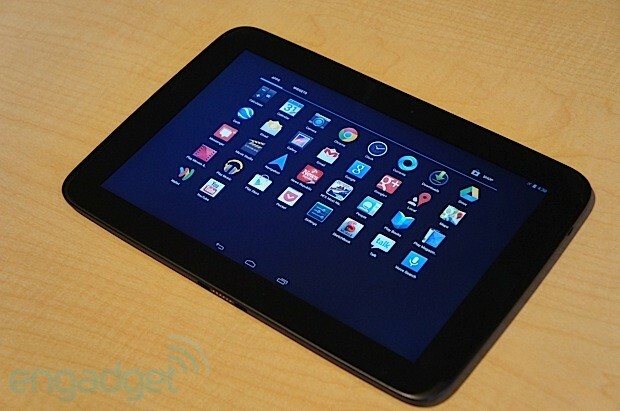 The Nexus 10 16GB model is priced at $399, 32GB model at $499. They will be available from November 13th onwards in the Google Play Store in the U.S., U.K., Australia, France, Germany, Spain, Canada and Japan. There is no info regarding the tablet's availability in India. The Nexus 10 tablet proved quite impressive. It is a combo of everything- work, entertainment all-in-one. Let us see how does it go for the tablet..
0 Respones to "Google Nexus 10 Tablet by Samsung goes official at the Google Event"